Jordan Spieth is looking to defend his U.S. Open title at Oakmont this week as he and the rest of the field will take on one of the toughest courses in America. He’s been preparing like every other competitor with plenty of practice rounds and range sessions, mixed with an autograph here and there. With autographs come crazy fans — ones that put their personal desires before those of younger children. That’s what happened at Oakmont on Monday. Spieth, however, won’t stand for it. He made that abundantly clear during his press conference later that day, revealing that he won’t sign your gear if you "smoosh a kid." Spieth admits he doesn’t like signing autographs for people who are going to use his signature for profit on eBay and other auction sites. That’s why he had absolutely no problem denying them. It’s no surprise that fans are trying to do anything they can to get their hands on a Spieth-signed piece of memorabilia, but patrons aren’t always as crazy as they’ve been at Oakmont this week. Spieth says kid-smooshing doesn’t happen regularly, "mainly at the Majors or a few events that have much bigger crowds." 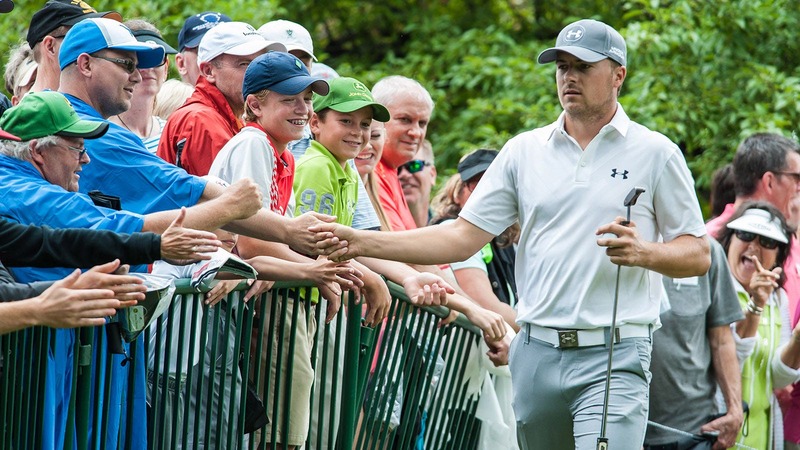 It’s nice to see Spieth taking a stand against big, greedy adult fans at events. The U.S. Open should be no different. He’ll tee off at 8:35 a.m. ET for the first round on Thursday, alongside Zach Johnson and Bryson DeChambeau.